Apollo 11 photograph of wet, blue Earth rising over dry, gray lunar foreground, July 20, 1969. August 26, 2010 Albuquerque, New Mexico and Honolulu, Hawaii - In the most recent edition of Nature Geoscience published online August 22, 2010, University of Arizona planetary geologists presented new lead isotope analysis from a chondrite meteorite found in the Sahara Desert that suggests our solar system is 4.568 billion years old. That could be almost 2 million years older than previously estimated. Our Earth's age is about 4.5 billion years old and most planetary scientists say the moon is about 30 million years younger. Our Earth is very wet and the moon is very dry. 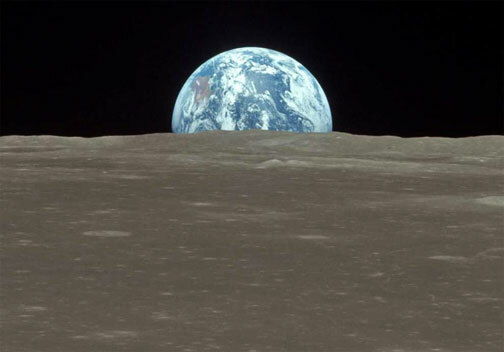 The oxidized iron content in moon rocks is also different than Earth's.. So, where did our younger, very dry moon come from? Next PostNext Part 2 – Hollywood Hit Squad?